Those who know me closely are well aware how lazy I am as a person and how nominal time I bestow to anything and everything possible in life except for the professional commitments probably. Even Pasta is well aware of the lazy nature of her mother. It is weird but true that I devote very nominal time to cooking (or baking) for that matter and what I believe in fuss-free life so that I can have an extra hour to enjoy a book with a cup of coffee or just to sleep with my little munchkin. 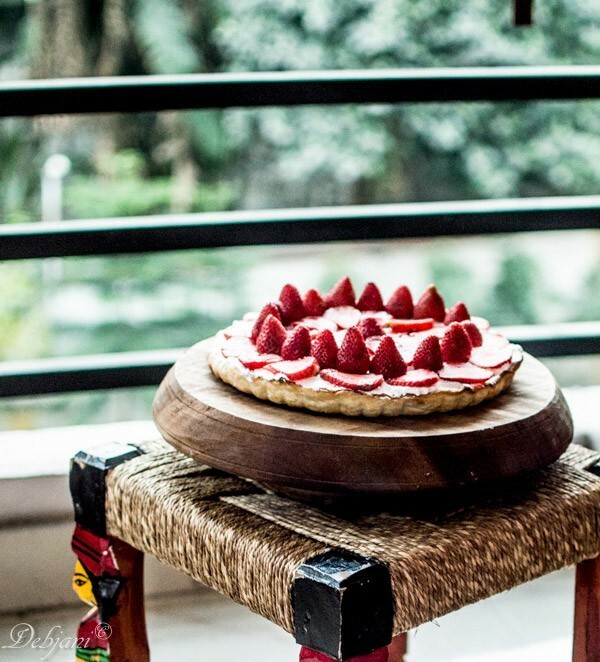 However, the recipe I am going to share today is really a fuss-free one with no compromise to the look or taste though, at least that’s what Pasta told me after having it; a simple dessert with one of my favorite seasonal fruit strawberry, and Strawberry Tart it is. Almost every season, I ended on making something or quite a few things with Strawberries and this season is no exception. I already have posted the Panna cotta with Strawberry coulis, Strawberry Custard Cookies, No Churn Strawberry Ice Cream, Strawberry Lemonade and a few more recipes with Strawberries here. Both me and Pasta and in fact Mehebub are in love with strawberries, though, the father-daughter prefer their portion as part of any dish while I can have strawberries in any form. The little one even asked for the second serving and husbandman found the filling per his liking. Strawberry Tart is the first Strawberry Post of 2017 and hopefully not the last as I already have planned for few more. Tupperware has sent me a Silicone Queen Mold a month back and I have used that to make a few cakes but was not satisfied with the pictures I clicked and finally decided to make something with the strawberries and ended on making the Strawberry Tart. It is a shallow round Queen shaped Silicone mold and is perfect for baking traditional pies and flans, sweet or savory quiche or pizza in the microwave or conventional oven as the Silicone Mold can withstand temperatures from -25 degree C to 220 degrees C.
I have used the conventional oven to make the Tart base for the Strawberry Tart. The Tart came out really well and that is probably due to the flexibility and Nonstick finish of the mold. The MRP of the product is INR 1990/-. I typically, don’t use silicone molds but found this one really handy and is perfect for those who are just started with baking. In fact, the recipe I am going to share is really easy and a novice can also easily bake and decorate. 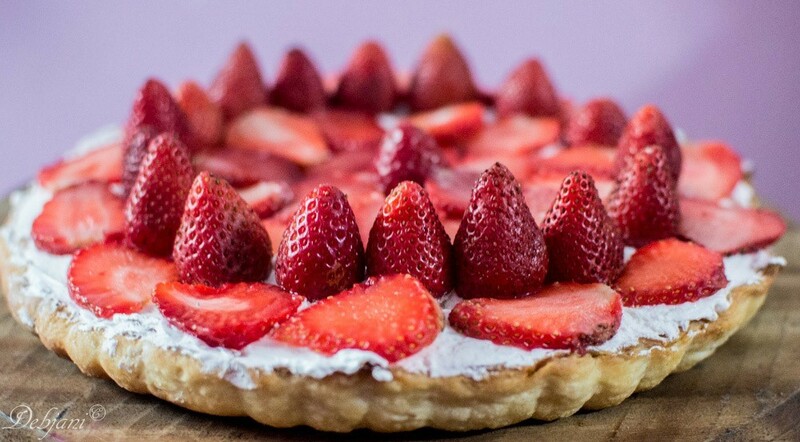 I have used a combination of Cream Cheese and Heavy Cream for the filling and used fresh strawberries to decorate the Strawberry Tart. 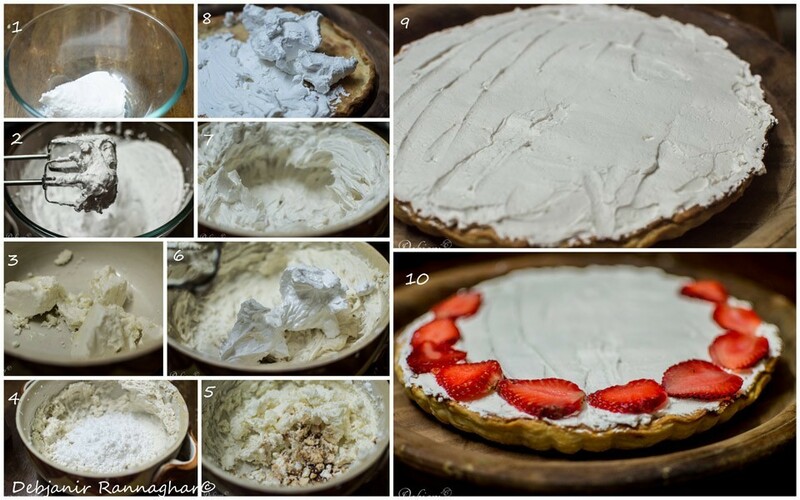 The recipe calls for the baking of the tart base and filling the same with the cream cheese and cream mixture and is a very easy dessert to make. Cut Butter into small cubes and refrigerate for 30 minutes. I prefer to place it in a deep fridge. Take All Purpose Flour along with the Salt and shift it twice and then keep in a refrigerator for 30 minutes. Place the Bowl to be used for making the Tart crust and mixing attachment of the mixer. 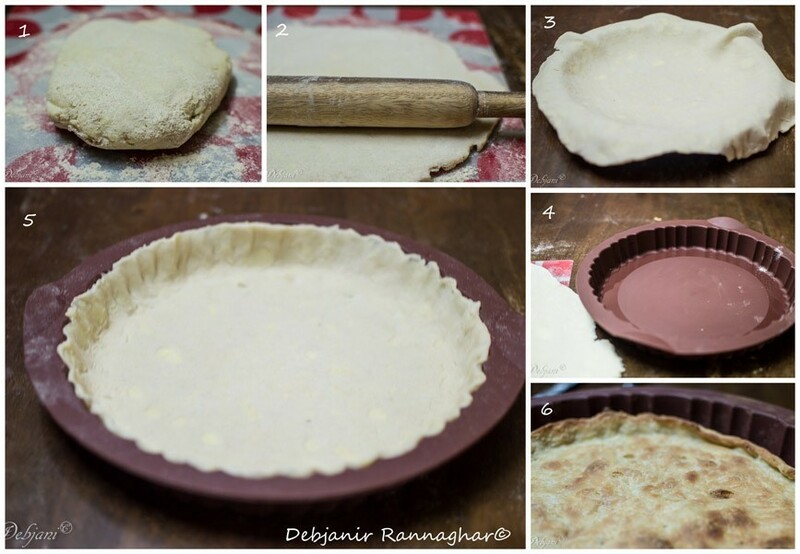 I use a hand mixer to make the pie crust) along with a fork in the refrigerator for 30 minutes. In half cup chilled water add 2-3 ice cubes and deep fridge that for 10 minutes. Now take the Flour and mix powdered sugar to it and fold lightly. Add chilled butter chunks in the bowl and using the chilled fork start cutting the butter chunks. Mix with the All-Purpose Flour until the butter chunks break into peanut-size pieces and the mixture turns into a crumbly mix. 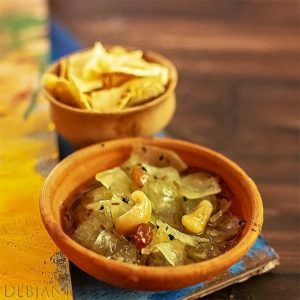 Place the mixture in the deep fridge for 10 minutes again and then take it out. Add little ice cold water to it. Start adding by 1 Tbsp. first and mix using the hand mixer and add little more water again knead. I ended on kneading after adding around ½ Cup ice chilled water and it is better to not to add extra water or the knead extra. There should be little peanut sized butter chunks visible in the Tart crust once the kneading is finished. Wrap the Crust with cling film and place it in the deep fridge for around 30 minutes before baking it. Using a Rolling Pin roll the Crust into half-inch thick flattened round crust sheet and place that carefully over the Tart mold for which I have used the Tupperware Queen Silicone mold. Bake for 20 minutes at 180 degrees C and after baking cool it on a wire rack before filling the same with the tart filling. Refrigerate both Heavy Cream and Cream Cheese for 2-3 Hours before using those. Now take the Heavy cream in a big bowl and using the whipping attachment of the mixer (I have used a hand mixer) beat the cream until stiff pick formed. Take the Cream cheese in another bowl and using the same attachment cream it and it will take around 5 minutes if a hand mixer is used. Add Castor sugar and Vanilla essence and mix properly. Now start adding the Whipped cream in the smaller portions to the Cream Cheese mixture and fold lightly. Now cut strawberries in the desired shape or you can use whole strawberries. I have used both. 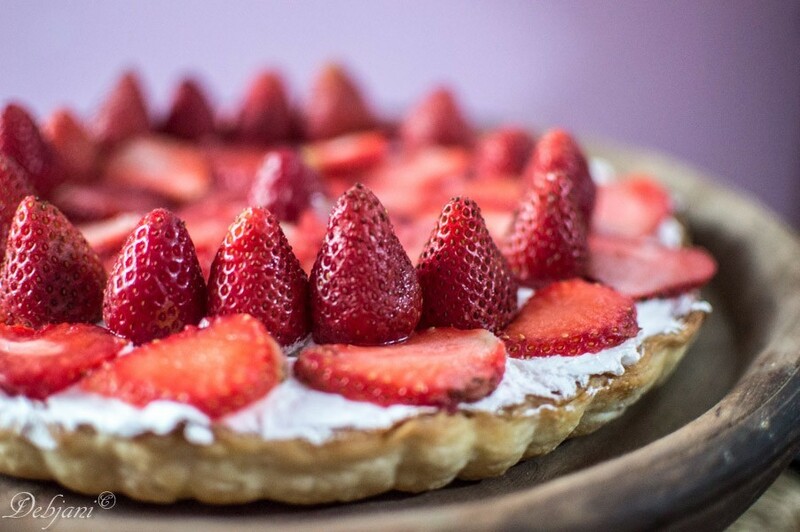 Now top the baked Tart base with the cream mixture and using a spatula flattened the same and decorate the tart with the strawberries and refrigerate before serving. Disclaimer: Tupperware sent the Silicone Queen Mold for review to Debjani.